I started A Small Town Fashionista a little over a year ago (I still can't believe it's been that long). Starting a fashion blog has always been something I thought about doing but I constantly talked myself out it--who would read it? I don't have the time or the skills. I have no one to take my photos.. they were all just lame excuses. Finally I told myself enough was enough, if starting my own fashion blog was something I really wanted to do then I just needed to do it and that's what I did. This blog isn't my full-time career, it's just something I'm genuinely passionate about. 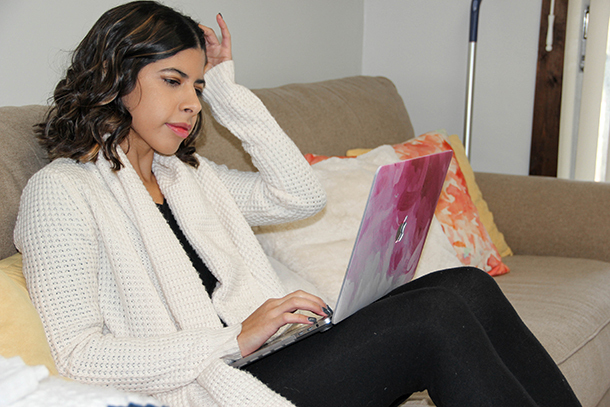 While I do love running a fashion blog, it's something that takes a lot of time to maintain. So I wanted to share a few ways that make running my blog a little easier while also working full-time and having an internship. Hopefully I can inspire others who want to start something they're passionate about but feel as though they don't have the time. PLANNING/SCHEDULING: This is so important and it took me awhile to realize that. Back when I started my blog I would just post whatever, whenever. I wasn't really planning content, which led to me hardly ever even posting. Then I tried posting every single day which only made me overwhelmed. At the time is seemed like a lose lose situation, but the only thing I was failing to realize was that I didn't have any consistency or a plan. I was in my senior year of college when I started ASTF so blogging Monday-Friday wasn't really realistic, so I decided on a MWF posting schedule. It all depends on your current situation for how much, or little, you can post. Whenever I graduated I went back to a Monday-Friday schedule because I had the time to do so, but now that I'm working full-time and have an internship I'm now back to a MWF schedule. It's also ok to switch it up--you don't want to overwhelm yourself with having too much on your plate! I plan content out a few different ways. I start by creating a monthly content calendar on Google Sheets. This allows me to know ahead of time what content will be coming to the blog and gives me time to plan it all out. 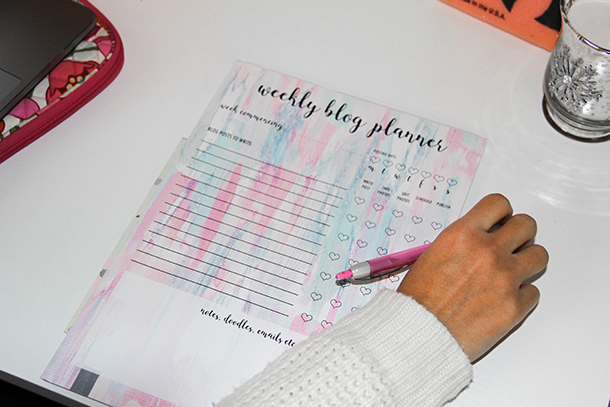 Then I do a weekly planner where I write out my whole blogging week. It just simplifies things and makes it easier to track down which content I need to be focusing on on my Facebook and Instagram for the week. I also use the 'stickies' app on my MacBook A LOT haha. Obviously my computer screen is something I look at a lot, so I just like to write out a few blogging reminders. TIME MANAGEMENT: This kind of goes hand in hand with planning and scheduling. Just about everything you do with your blog requires some sort of time management. 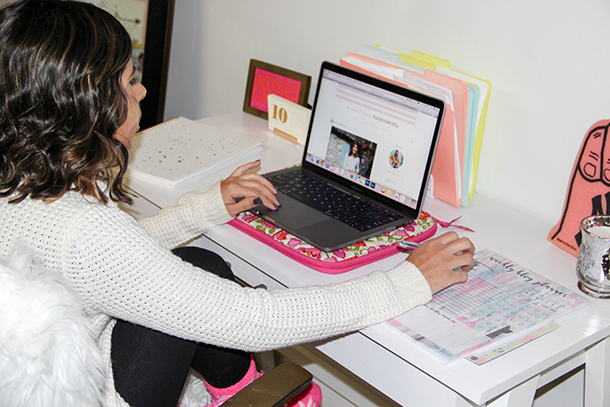 Having a set work schedule helps when it comes down to setting time aside for blogging. Sunday evenings are always photoshoot day, then Sunday, Tuesday, and Thursday nights are set aside for creating and editing. Creating to do lists are also extremely helpful. I'm going to be honest, my blogging to do's are last priority just because I have other commitments, but a list also ensures I'm getting everything done. After awhile you sort of pick up how long it takes to do certain things like editing photos, writing out posts, etc. so eventually you'll have a better understanding of how much time you need to set aside. BEING AHEAD OF THE GAME: There's nothing I enjoy more than seeing an entire week worth of blogging already scheduled. Any free time I have during the week I grab a glass of wine, put on Netflix, and head straight to the blog. Being on schedule is already a good thing, but being ahead of it is the best. I've also recently been trying to shoot all photos I need for posts for an entire month at a time. This sounds crazy, and impossible, but with a MWF posting schedule that brings me down to about 16 posts a month and not every post I do requires a photoshoot. This past weekend I was actually able to shoot all of November's content, minus two. Happy, happy Alyssa!